Excerpt from Eris in Astrology: Facets and Fragments of Self, published in full in the 2007 Planet Waves Almanac. An earlier article in Planet Waves Weekly, published last September, explored the connection between Eris and something called postmodernism. Paloma Todd originally handed me that idea one day based on her assessment of Xena, and I am indebted to Richard Tarnasfor helping me clarify it, particularly the idea that the blurring of the edge of the solar system, and thus its gradual merging with the galaxy, is a postmodern phenomenon. If astrology and the positions of the planets are a reflection of the psyche, let's consider what that means today. In 1800, there were seven known planets: Mercury, Earth, Venus, Mars, Jupiter, Saturn and Uranus. Uranus was the first planet discovered by science (in 1781), the first planet of what is called the modern era. In 1801, Ceres was discovered, and became the second. By 1807, three additional small planets were discovered (Pallas, Juno and Vesta, respectively), and as a result Ceres and its cohorts were re-classified as asteroids. Asteroid discoveries continued steadily, to the present day. By 1977, there were nine major planets; Neptune was discovered in 1846 and Pluto in 1930, and nothing after that was counted. 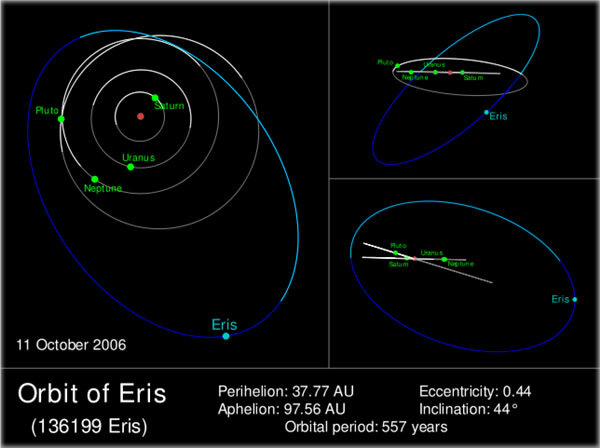 Chiron was discovered in 1977, and the next year was given minor planet catalogue number 2,060 (a total mostly comprised of various kinds of asteroids, all of them located in the inner solar system). Chiron was the first body besides a comet discovered that moved in and out of the inner solar system, crossing the orbit of Saturn and extending nearly out to Uranus. But it's an exceptionally large comet (known as a proto-comet), believed to have been pulled in from the outer solar system in a region where there are currently many discoveries happening. Let's skip ahead a quarter century, remembering that there were 2,060 minor planets in 1977. The discoveries mounted through the 80s and 90s, and Varuna was discovered in 2000 and given minor planet number catalogue 20,000 (a place of honor -- it was a major discovery). Two years later, Quaoar was discovered and was given minor planet number 50,000 (another place of honor, as it too was a major discovery). As of the end of 2006, there are about 150,000 planets in the minor planet catalogue, and tens of thousands more pending inclusion in the catalogue once their orbits are firmly established. Notice that this is an exponential rate of growth, too fast to actually comprehend, too diverse to pin any fixed meaning on, and impossible to assimilate using any prior method of using astrology. You cannot make up an acronym to memorize a hundred thousand or more planets. Most astrologers cope with the problem by working on the assumption that these things must either be meaningless, or we cannot actually know what they mean. However, regardless of what any individual planet means, if astrology is a picture of the human psyche and its relationship to the cosmos, the first and most basic principle of astrology, then we are being confronted with something that we can't really comprehend using an old reality framework. So, the cosmos itself presents a picture of a psyche in an identity crisis; yet as the music of the spheres is going faster and faster, most practitioners are sitting on the sidelines, occasionally tapping their feet. But here is another image. Many of these discoveries are on the edges of the solar system, and the archetypal idea we have about the edge is always interesting. In ancient times, it was Saturn: structure, authority, the lord of time, sometimes depicted as the grim reaper. This was the image of a firm edge to reality, outside which existed the firmament. Visitors from outside, comets, were almost always construed as ill omens. At the beginning of the modern age, the age of science, the edge became Uranus, the planet of invention and technology -- and we lived through an era of rapid industrialization and scientific progress that has perhaps exceeded anyone's expectations. Then for a short while, the edge was characterized by Neptune, when image began to take over; photography, cinema and advertising increased in power radically at this time, with drugs and other chemicals (Neptune themes) becoming increasingly important to individuals and to industry. Then, beginning in the 1930s, the edge became Pluto: a different kind of death than the individual meeting with the end that Saturn offers -- megadeath. While there is more to Pluto than this, much more, we cannot erase from history the rise of Hitler beginning just three years after the discovery, and after his successful defeat by the allies, the rise of Stalin, whose gulag system dwarfed Hitler's concentration camp system. Indeed, the wars of the 20th century have not ended as we begin to conclude the first decade of the 21st century. The deep cynicism that I can only describe as, "death is all that matters, and death does not matter" has in the age of Pluto defined the edge of consciousness. Or, as my old therapist Joe once remarked, "Death works." One way death worked was as a means of defining the supposedly ultimate fate of a human being, and then a personality being constructed in large measure around this concept -- known as Thanatos in Freudian psychology -- be it through denial, fear or manipulation. Yet now the unprecedented number of new discoveries at the edge of the solar system defines the edge as a kind of haze, not a tangible barrier, a cliff, bottom line or looming threat. There are now as many ideas about death, and the life of the soul, and about what is beyond this reality, as there are plutinos, cubewanos, other Kuiper objects and scattered disk objects occupying the region of space in which Pluto was long thought to be the only resident. What this has done, in effect, is blur the boundary between the consciousness of the solar system (our local model of consciousness) and that of the galaxy around it (a more macroscopic model of consciousness). In a typically postmodern way, the clearly defined edge, and the clear definition of what the edge means, is melting. That, in turn, points to something deep within us opening up. We now have psychic mobility, and a choice of where to park our consciousness at the edge or inner edge, or maybe in the spirit of the Little Prince, we will visit many possibilities. Certainly, we have that option, and the opportunity to reach beyond any previously thought of idea of what a self is, into something far beyond, and rich with the potential for discovery of a more encompassing experience of self. Who will take that opportunity and who will basically just do their best to survive in the fertile chaos that defines our era? It may be a matter of will, initiative, chance or having the guts to follow a calling: in short, the same things that have always led certain people to self-actualize regardless of the times they were living in. Considering for a moment the sexual aspect of Pluto, it is clear that while sexual instinct was considered in the later modern period (from Freud onward) a kind of indelible parallel bottom line to death, many people are now reluctant to admit this, or even experiment with it. Therapy traditions, which at one time did effective work leveraging off of sexual instincts, are now developing techniques that look at the numinous or indefinable nature of that bottom line, rather than working with something considered by many to be so crude and basic. This offers a degree of freedom -- and yet as we shall see in the next section, resisting or denying the deeply instinctual and primal nature of human consciousness has serious risks. Yet interestingly, despite all these advances in astronomy, no one discovery since Pluto had compelled planetary scientists to deal squarely with the issue of planetary definition, a controversy that most astrologers avoided by pretending it wasn't really a question. Presumably, as astronomers (ones who "name the stars"), this type of naming and categorization is their primary function. Since the 1992 discovery that Pluto was not alone in its region of space (this was the year another planet, called 1992 QB1, was discovered, proving the existence of the Kuiper Belt), the question had been quietly brewing. Finally, Eris popped the cork. Astronomy officially entered the postmodern era. The third of what are called the "modern planets," specifically, Pluto, was reclassified as a new type of planet, a dwarf, and it became the first postmodern planet. Ceres was resurrected from two centuries of obscurity and added to the mix; and the first postmodern discovery was given a name and a clear place in a newly ordered solar system. 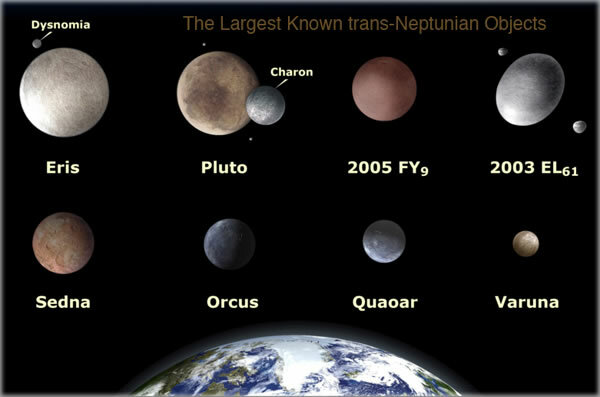 This, in turn, has opened the door for many other dwarf planets to be recognized, and it will be interesting to see what will be the next planet included. But one thing is certain: Eris disrupted the established order sufficiently to compel astronomy to catch up with itself. It remains to be seen at what rate astrology will begin to take the cues, or embark on the adventure. Surely, many astrologers are personally involved in the kinds of spiritual and mystical advances that Eris portends, as well as the quest for a new concept of identity and its relationship to the larger world. Whether they are able or willing to apply their craft to this is another question.